During my Career Break, I spent most of my time in Europe exploring the Balkan and Baltic region, but I also spent a couple of days exploring Zurich as I visited a good friend R (that same friend who I visited in France/Spain way back in 2007) who was living and working just outside of Zurich at that point. Switzerland is a beautiful place, but one particularly strong impression is that it is so, so expensive. $10 for a train station hot dog? $20 for a beer and food from an outdoor food area? I know people say Singapore is expensive as well, but I’m still glad we’ve hung on to our still affordable hawker food. The other thing that struck me about Zurich were all the mountains. I had some excellent weather while I was there and the views were spectacular, which is what I wanted to bring out in this piece. I will never be any sort of mountain climber but I do like admiring them from afar, and I always a love a great high viewpoint. 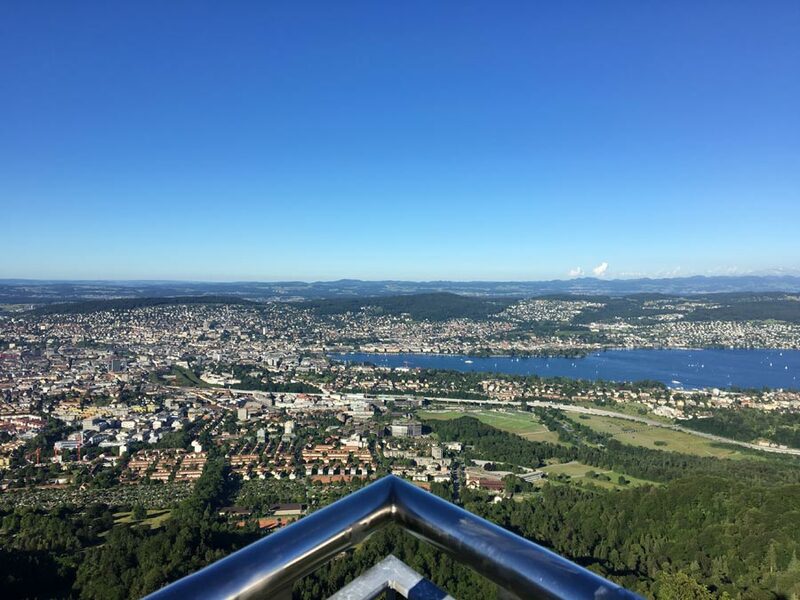 So when Skylife Magazine asked me to write something about Zurich, I definitely had some mountain inspiration going on in coming up with this piece, and wanted to showcase various viewpoints around Zurich to get a bird’s eye view of the city. Check out my first article for Skylife on how to explore Singapore via the MRT system, and another one I did on visiting the outlying islands in Hong Kong. This article was first published in Turkish Airlines inflight magazine Skylife in September 2017 and reproduced here with permission. See the online version here. Pictures in this article are my own. A window seat is a must when you fly into Zurich, so you can behold the majesty of its snowy mountain peaks from a bird’s-eye view. I hail from a country of densely packed high-rise buildings where the highest point of elevation is a measly 164m, far shorter than any of the mountains that waited for me in Zurich, and I was looking forward to finding all the majestic viewpoints during my week in Switzerland’s largest city. Mountains tend to crop up when it comes to anything Switzerland – they are practically a cliché when you look at a Swiss company’s branding – possibly because they are such a constant part of the Swiss experience. You don’t have to try very hard to see a mountain view in Switzerland. Even walking around in downtown Zurich, the perpetual mountainous panorama made me feel like I was living on an epic movie set, with exquisitely painted mountains around every corner. 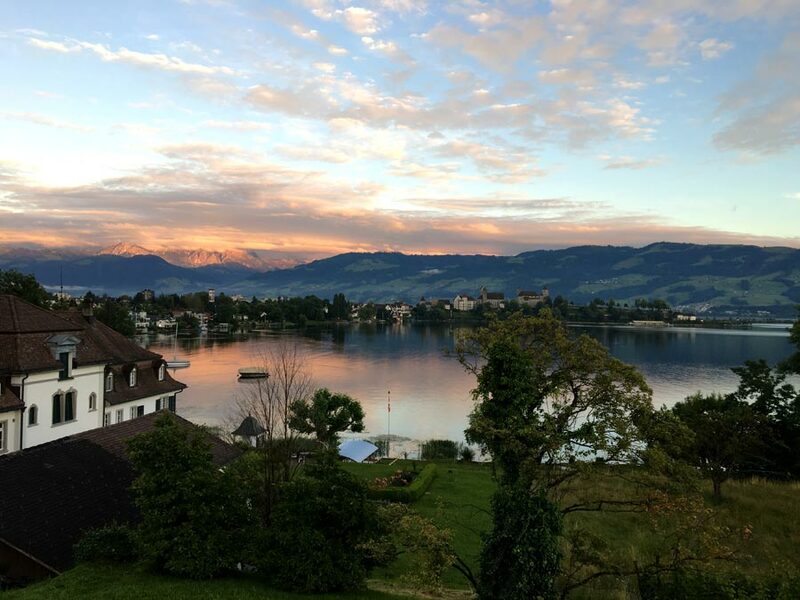 Ok not exactly Zurich, but my friend lived around Zurich Lake in a little town called Rapperswil which is absolutely gorgeous. Imagine waking up to this every day! For a modern metropolis, Zurich has surprisingly few skyscrapers compared to its counterparts around the world. A combination of building height regulations and local lobbying has kept most of the city skyline relatively low. I hop on one of the famously Swiss-efficient trains and head to Hardbrücke in Kreis 5 of Zurich West, and it’s hard to miss the 36-storey tall Prime Tower, towering over its neighbors at 126m in this industrial-turned-trendy district. Prime Tower was once the tallest building in all of Switzerland until the Roche Towers in Basel came along, but for such a tall building, it almost disappears into the sky with its ultra-shiny surfaces that reflect the clouds and mountains around it on a clear day. One can choose to dine in the restaurant on the top floor of the modern Prime Tower for a meal with a view, but I decided to take a stroll along the nearby Im Viadukt, a relic of the old railway viaduct built back in 1894. 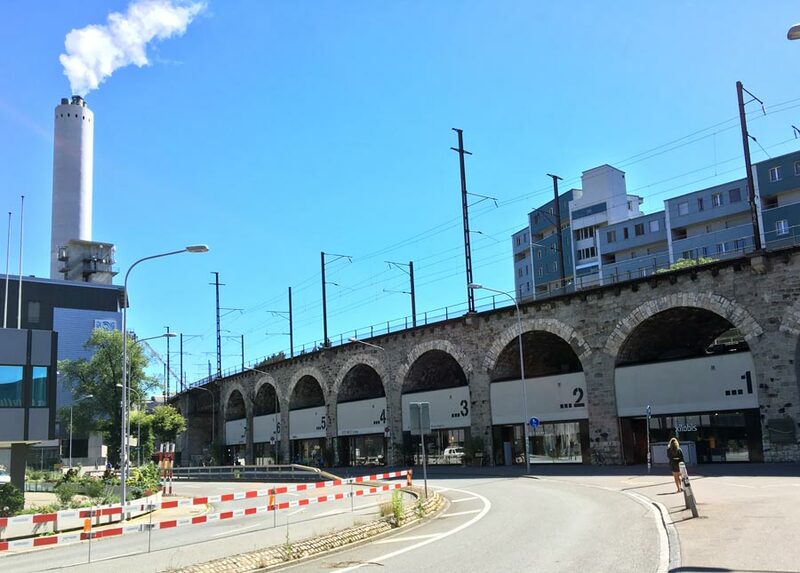 Today, funky galleries, boutiques and fancy delicatessens occupy the once empty arches beneath the viaduct, transforming it into one of the hippest shopping stretches in Zurich. I stopped for a quick lunch in the Markt Halle, spoilt for choice with the option of fresh produce, cheese and even some sushi. Not far away from Im Viadukt, a random looking pile of containers caught my eye. 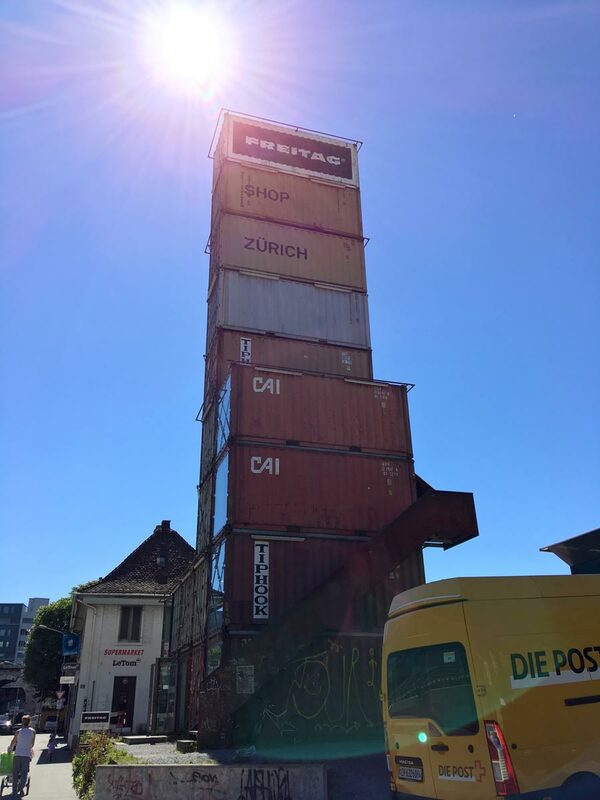 Seventeen stacked containers form the colorful and singular Freitag Tower, home to the internationally renowned brand that produces fashionable bags out of used tarpaulin and other recycled materials. I was sorely tempted by the spread of one-of-a-kind accessories laid out before me within those modern walls, a stark contrast to the gritty industrial feel of the containers. 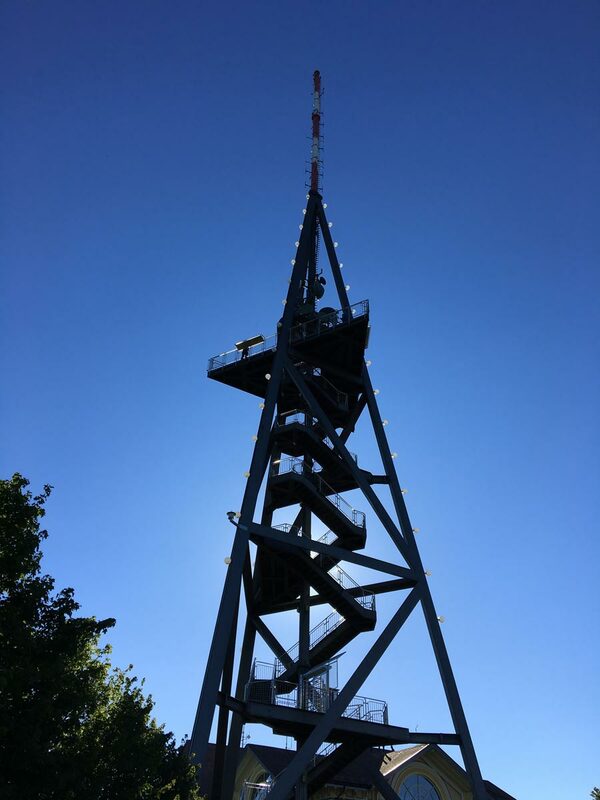 Visitors climb to the top of this 26-meter-tall industrial beacon, complete with viewing platform and binoculars to enjoy the view of downtown Zurich. There are more traditional viewpoints of course – while sightseeing in the old town area or Altstadt, I found myself craning my neck at the base of the twin towers that make up the famous Grossmünster, a 12th-century Romanesque Protestant church that has become one of the most iconic sights of Zurich. I especially loved the unusually modern and eye-catching stained glass windows by German artist Sigmar Polke that look nothing like your typical religious art – I had to buy a postcard because they didn’t allow pictures. 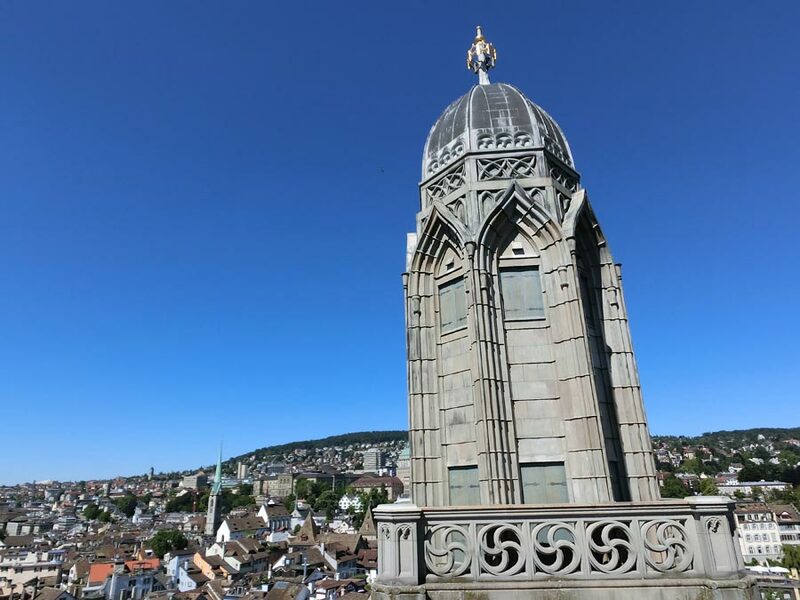 I paid a small fee to ascend the 187 steps of Karlsturm, one of the Grossmünster towers. 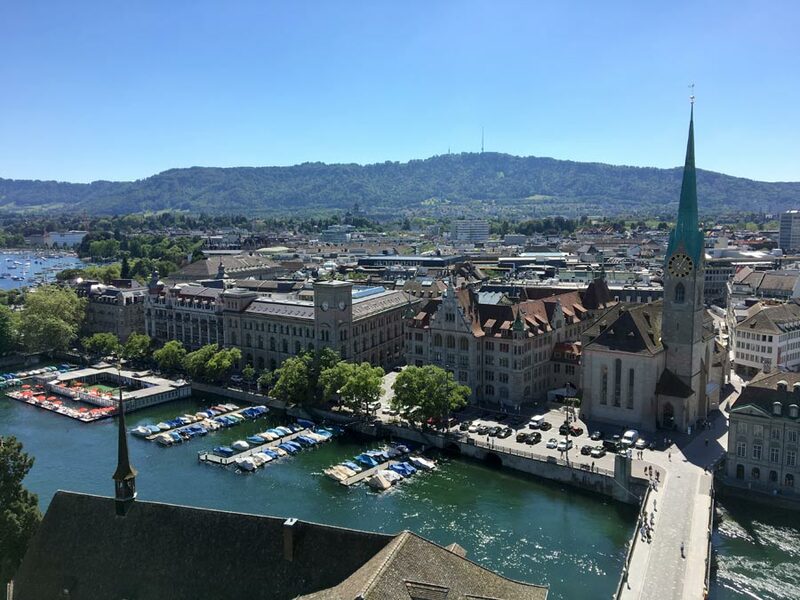 I was not expecting having to clamber up extremely narrow staircases or navigating some rickety looking ladders, but the 360 degree view of Zurich’s rooftops and the surrounding mountains definitely made it worth the effort. 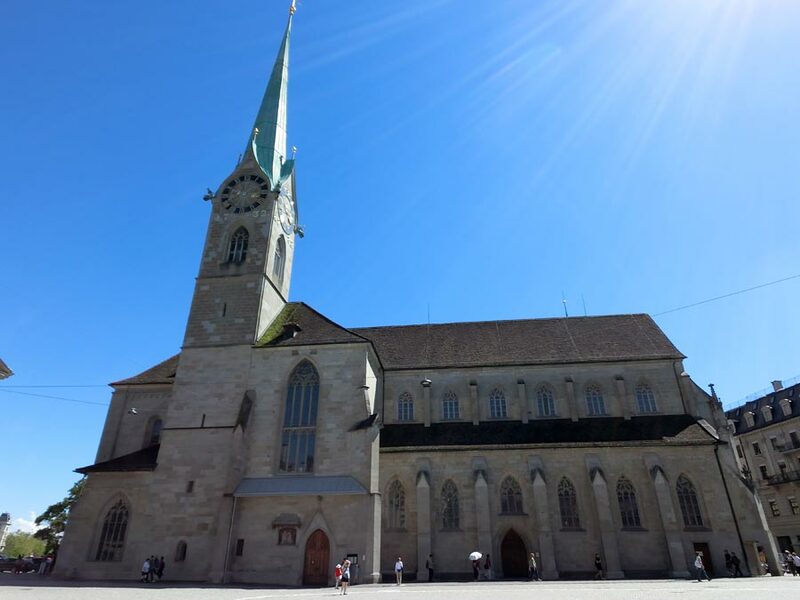 From Karlsturm, I had a good close up view of the neo-Gothic, gently domed shaped towers of Grossmünster, and when I looked across the Limmat River that runs through the heart of Zurich, I spotted the slightly older Fraumünster Church with its tall, skinny green spire. While there are no viewing points in Fraumünster, it has its own set of famous windows by modernist artist Marc Chagall that draws the crowds. 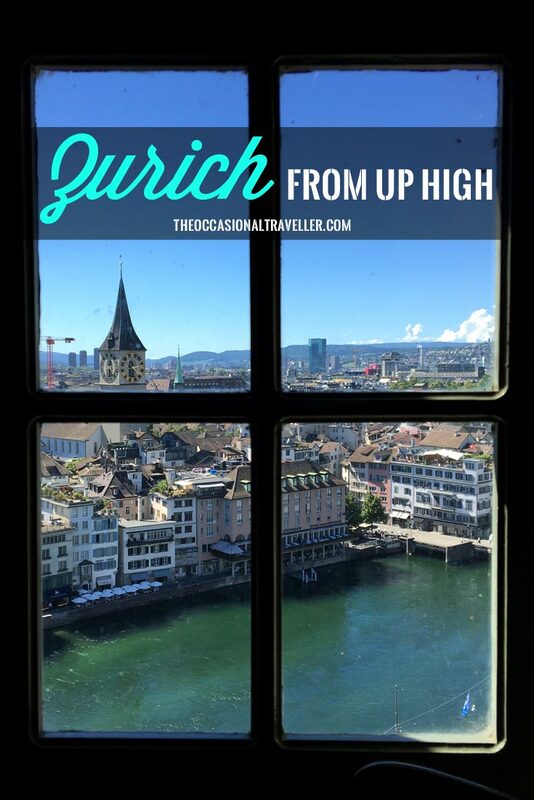 I added another set of postcards to my growing collection of beautiful sights in Zurich – the gallery of my phone’s camera was already bursting with panoramic views of the city. 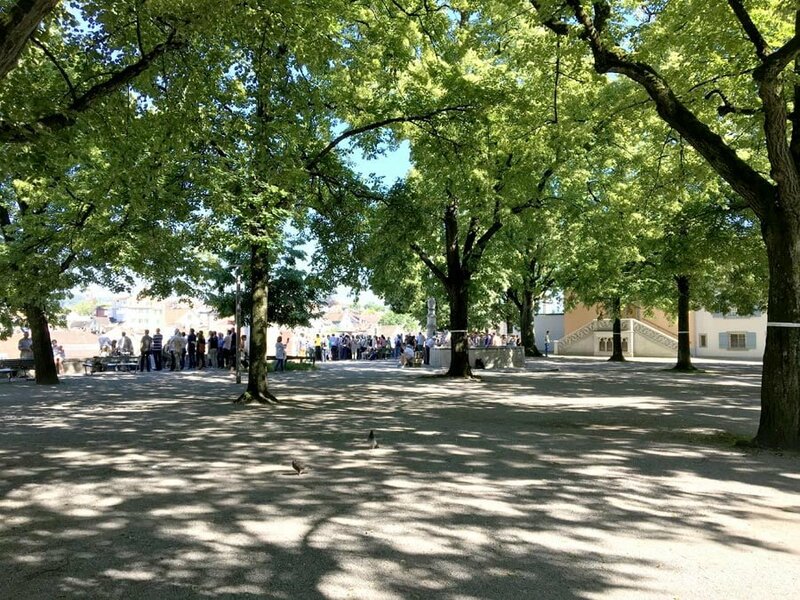 Fraumunster – no pix allowed inside! 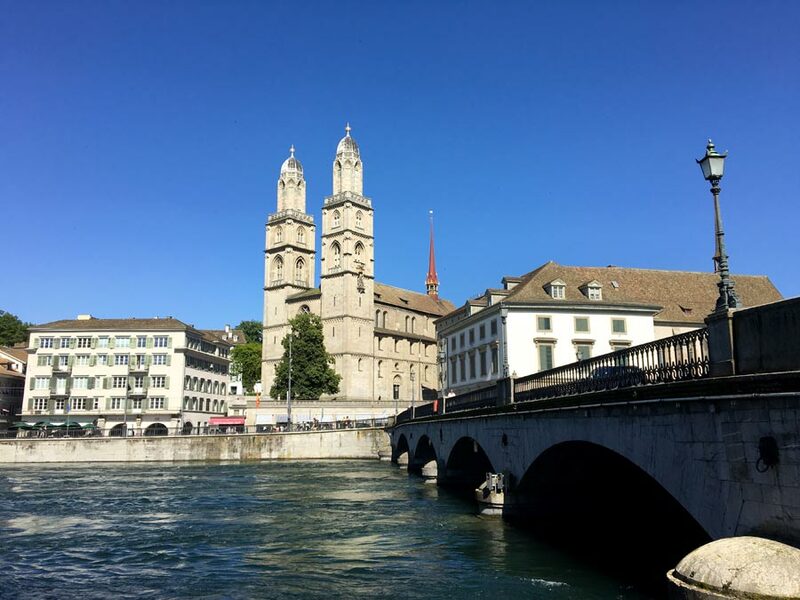 A short walk north of Fraumünster took me to Lindenhof hill, where a short uphill walk brought me to a small shady plaza that rises 25 meters above the Limmat, providing a picturesque view of the river, including the towers of Grossmünster and Fraumünster. Once an important Roman fortress, these days Lindenhof mostly sees duels between competitive chess players rather than any actual battles. It’s a pleasant place to spend a quiet afternoon, occasionally punctuated by groups of curious tourists enjoying the view of Zurich from up high. To cap off my week of sightseeing and viewpoints in Zurich, I found myself back on the train which took me to the foot of the Uetliberg, also known as Zurich’s local mountain. I followed some well-marked trails through foliage that brought me to the top of Uetliberg, 871 meters above sea level. 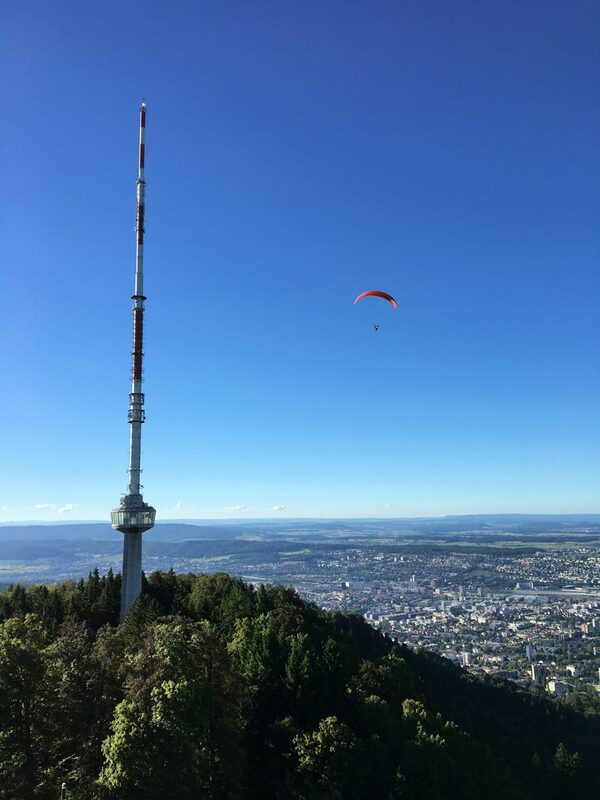 At the peak of the Uetliberg, you can climb another 72 meters up the observation tower, a structure best described as a modern minimalist pyramid with a lot of stairs. Even as my legs were burning a little from the earlier trek, I trudged up more steps and was rewarded with a truly spectacular view of Zurich city from above, a sprawl of buildings surrounded by green hills and those painted mountains in the distance, with the occasional paraglider floating effortlessly across the clear blue sky – another popular activity in these parts when the wind is blowing just right. And yes, there was a random paraglider just floating around up there. It’s pretty windy! Most visitors to Zurich often include a day trip to nearby Mount Titlis or Jungfraujoch, both mountains that are over 3,000 m high and peaks easy enough to reach without a strenuous hike. But while I have so many places left to explore around the city, I was short on time, and I left Zurich the next day with mountains on my mind and a desire to climb higher the next time I return! 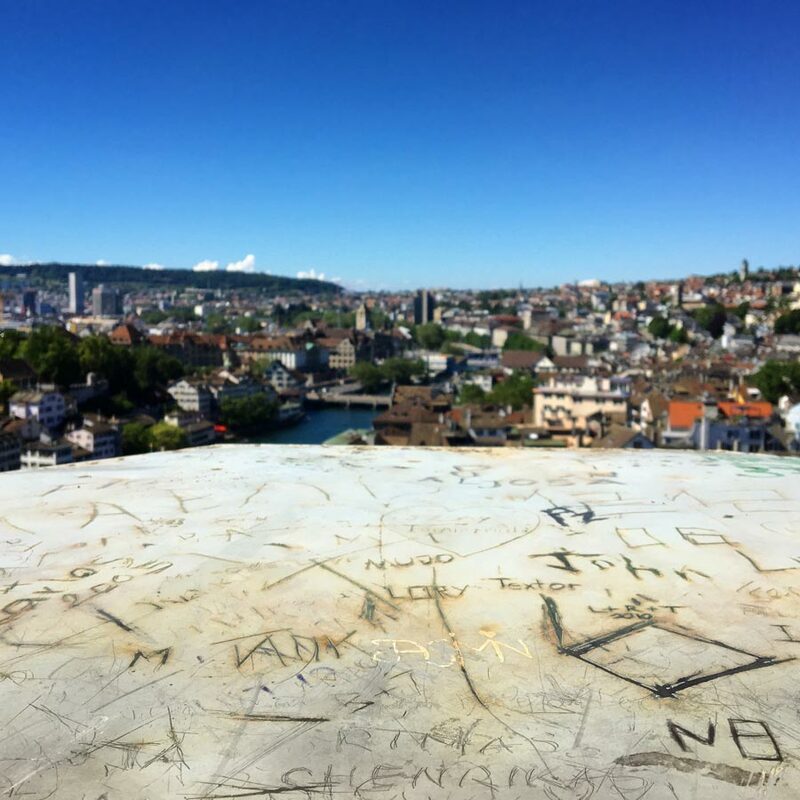 Where are your favourite high spots in Zurich? Share them in the comments. Anyway, keep on exploring the world and writing about! The one thing I love about Singapore is the relatively cheap and good food, so having to pay so much for food in Zurich was mind boggling for me! But yeah it’s great to hear what other people think about Singapore too :) Thanks for commenting and have fun when you do go to Penang!